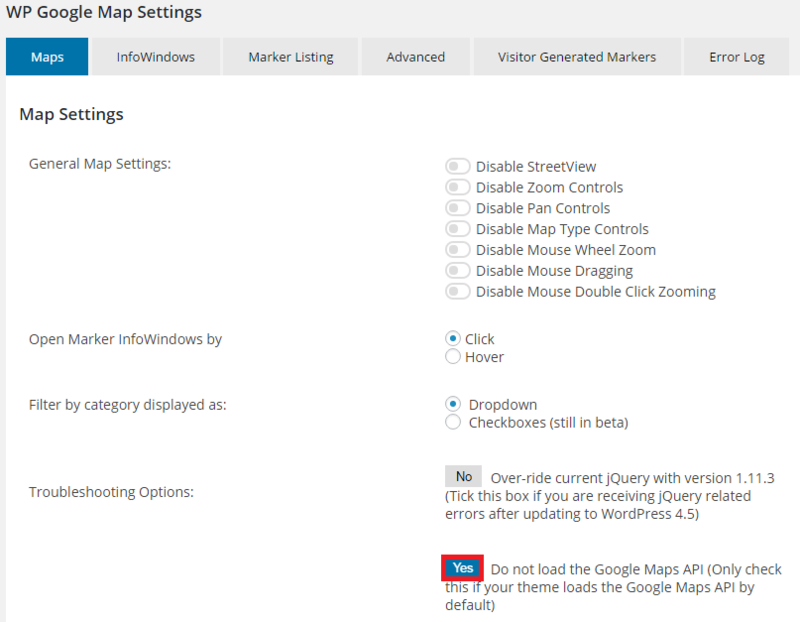 This article covers troubleshooting a Google Maps Multiple API error with the WP Google Maps. This documentation is current for WP Google Maps version 6. WP Google Maps includes a script which removes all previous calls to external APIs on the page where our map loads. This does not always work as some API calls are deeply embedded. In these cases you may still see the “you have included the google maps api multiple times on this page” error. If you are encountering the Maps Multiple API error message, follow these steps to prevent WP Google Maps from loading the Google Maps API itself. Click the toggle button (the default is No) so that it says Yes. This will stop WP Google Maps from loading a call to the Google Maps API. Note that some plugin functionality may not be available after taking this step since the other call to the API may not include the same parameters as ours. However, the map should display properly on your site and you will no longer have this warning appear. If you need further assistance, feel free to post on our Support Forums or visit our Support Desk.